You still use Dycal ? Fusion is a developmental anomaly of teeth. It is defined as the dentinal union of two embryologically developing teeth. It is more commonly seen in primary dentition and more frequently in incisor region. 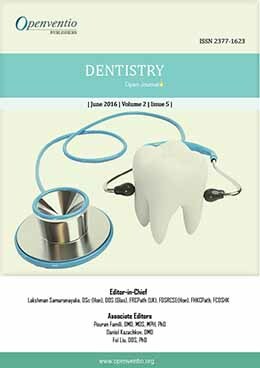 This paper reports a rare case which had the presence of bilaterally fused primary central incisor and lateral incisor in the mandibular region. In developed countries, orofacial pain is one condition in dentistry that has been well defined, explored, and managed. Unfortunately, unlike the grown and developed management of orofacial pain in developed countries, the management of orofacial pain in developing countries is still poorly performed. 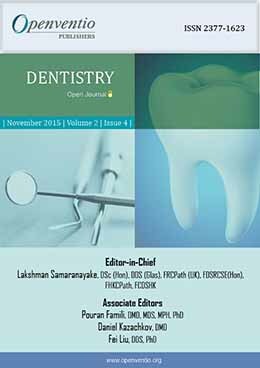 The current article discusses about the current management of orofacial pain in developing countries. At the time being, there are several factors that are considered to be the etiology of the unsuccessful management of orofacial pain in developing countries. Lack of knowledge about the symptoms of orofacial pain is considered to be one of them. Therefore, educating more people about orofacial pain and its symptoms should be included in the comprehensive plan of orofacial pain management plan in developing countries. As the problem of orofacial pain in developing countries is happening at the root level, the education should not only cover those who are responsible in treating orofacial pain but also the one who might experience orofacial pain. 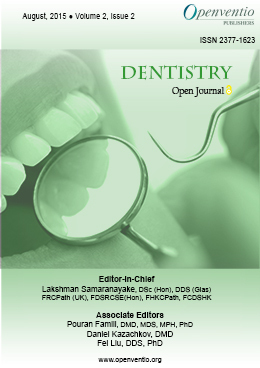 It is expected that the current article will provide a current insight about the management of orofacial pain in developing countries as we as well the current barriers of orofacial pain management. And furthermore, initiates more studies in the field of orofacial pain in developing countries. Objectives: When using dental handpieces (HP), a phenomenon of backflow leads to an external and internal soiling and contamination of HP, especially in their narrow air/water pipes. To prevent any cross-infection, HP need to be sterilized after a thorough cleaning. This work aims to establish and assess a method for testing their cleaning. Indeed, there is a methodological gap concerning its validation because of their complex architecture. Materials and Methods: This method is declined into a protocol using artificial soilings and ninhydrin tests. Its evaluation with a washer-disinfector-lubricator-dryer (WDLD) within 2 cleaning cycles with each 6 HP and after control tests, heads to validate its relevance and to demonstrate the effectiveness of the cleaning provided. Results: After each cycle, all HP were externally clean. Our method also showed an internal cleanliness except for 2 HP whose engines in the automaton were defective. Conclusion: This work fits with the improvement of infection control in dental practices. It is the first method developed to control the internal cleaning of HP without having to break them, and it demonstrates the need for HP to be put into an internal rotation during their cleaning. It fills the methodological gaps concerning their cleaning and allows assessing HP cleaning from dedicated WDLD. According to standard NF EN ISO15883, the method could be used for initial steps of operational or performances qualifications concerning HP cleaning. Oral Cancer Biomarkers: Is it a Meaningless Game ? Aim: Oral health can affect the quality of life (QoL), and the oral health impact profile-14 (OHIP-14) index utility to assess this impact. Objective: To study the impact of oral health on quality of life of patients older than 50 years, verifying, preliminarily, the reliability of the OHIP-14 index. Methods: We studied the internal consistency of the index by applying the alpha-Cronbach coefficient. The OHIP-14 index was obtained by the additive method, and the patients were divided according to gender, age and education level. Results: Considering all the issues that make up the OHIP-14 index, good internal consistency was obtained. The homogeneity of the questions in the index, it was confirmed that condition, since the difference between the value of the total Cronbach’s alpha-factor and issues was less than 0.03. The values of the intraclass correlation show the stability of their items. 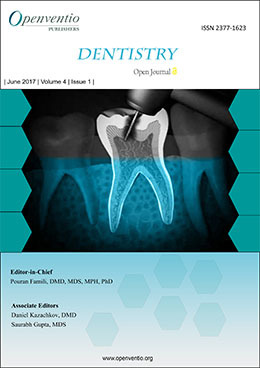 Conclusion: The OHIP-14 index was consistent and proved to be there relatively high impact of oral health on QoL of patients, with a predominance of physical pain in its components “feel bothered to feed” and “feel pain in the mouth” as well as the components of the psychological impairment. Congenitally missing teeth are a common developmental abnormality. It is defined as the developmental absence of teeth excluding the third molars. It is more commonly seen in permanent dentition but rarely in primary dentition. Second premolars are the most commonly missing teeth after the third molars. 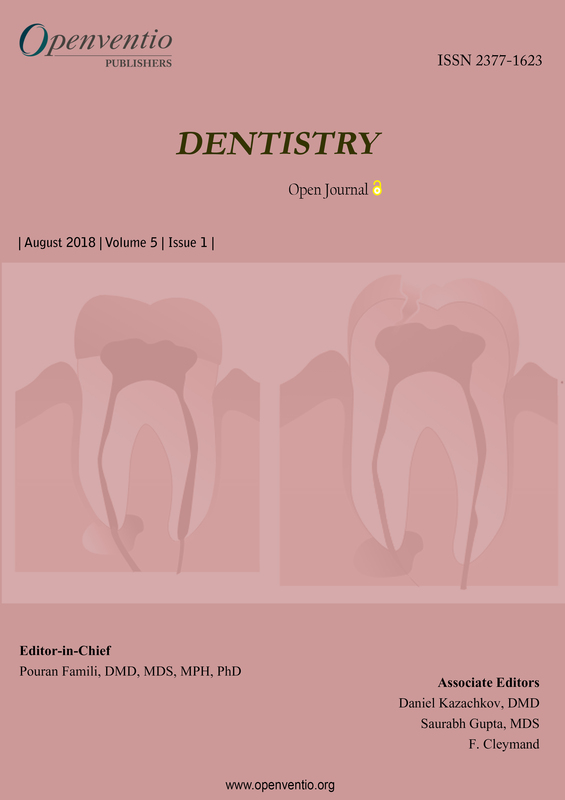 This paper reports a case of non-syndromic bilaterally congenitally missing second premolars in the mandibular region and its management. Oral Cancer Biomarkers: Is it a Meaningless Game? Is Salivary Exosome the Answer to Early Detection of Oral Cancer? Dentistry is the branch of medical science that involves all aspects of oral health and pathology of the oro-facial complex and their related systemic manifestations from infancy to geriatrics, inclusive of the neurologically challenged or disabled. Dental caries (tooth decay) and periodontal (gum) diseases remain as the most prevalent diseases affecting the human kind, despite decades of research, and effective public health interventional measures, such as water fluoridation. 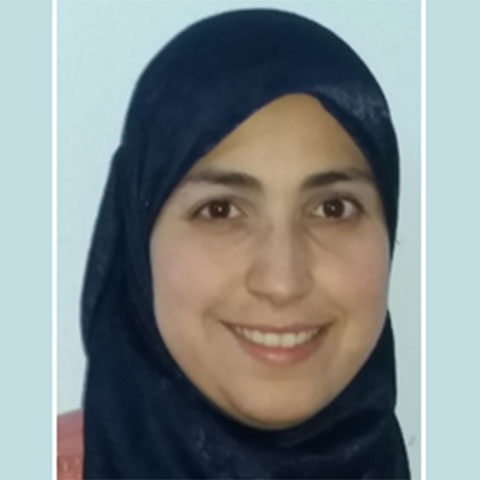 On the other hand, from a clinician’s perspective, there are persistent diagnostic and management challenges with respect to pathologies associated with developmental and acquired anomalies, and as well as worn dentition. The latter in particular is a growing concern due to the increasing burden of frail elderly in most developed countries, who are sustained through modern medical interventional measures. 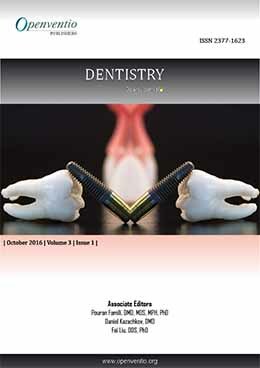 Furthermore, dental practitioners in both clinical and academic area as over the past several decades have witnessed dramatic and far reaching technological advancements in materials and instrumentation. These cutting edge developments in dentistry will further expand our horizons to best meet future oral and dental needs of the populace. 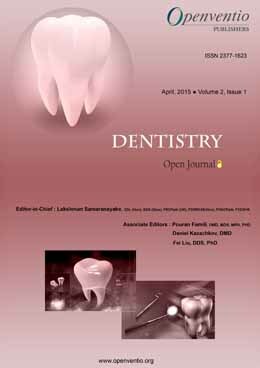 The aim of Dentistry – Open Journal (DOJ) is to expand and advance the quest for greater knowledge in all matters of scientific and clinical, permeating the oral and dental health of the community. The scope of DOJ is to act as a vehicle of knowledge transmission on oral and maxillofacial health matters across all aspects of dentistry embracing clinical, medical, surgical, epidemiological, pedagogic and critical care aspects of dentistry, through objective and peer-reviewed analysis. The audience of DOJ includes general dental practitioners and all other specialty areas of dental practitioners including dental hygienists, dental surgery assistants, prosthetists, dental technicians, dental educators and administrators, pharmacologists, pathologists, basic scientists, physicians and surgeons,as well as dental and medical students. The journal welcomes all article types including original. prospective and retrospective research, literature reviews, case reports, editorials, letter to the editor, position or opinion papers, commentary, conference proceedings, technical reports, and illustrations depicting clinical conditions and narratives. Finally, we also welcome comments, or critique from any interested party to further enhance the quality of our journal. Please send us your thoughts using the Contact Us link.